Alfred was born in Devizes in 1895 the second son of William Ashfield and his wife Sarah Georgina (née Cook). William was from Devizes while Sarah was from Micheldever in Hampshire; they married in Portsea in 1889. William moved around following work , usually as a maltster but also as a cellarman. Both occupations are related to the brewing trade, which was flourishing in Newbury. The Ashfields moved to the Newbury area around 1896, first to Donnington, then a couple of years later into Newbury; living at 5 Caroline Place (off Northbrook Street). William was working as a maltster for one of the breweries. In 1904 they moved into 6 New Square, an alley off Bartholomew Street. Alfred was the last child born in Devizes, but there were plenty more to come; by 1911 there were nine young Ashfields sharing the small house in New Square with their parents. The eldest son, William John was the first to ease the congestion when he decided that he wanted more from life than his job as a baker’s assistant offered and enlisted with the Royal Berkshire Regiment. When war broke out William was serving with the 1st Battalion, one of the first battalions to reach France with the 2nd Division on 13 August 1914. Pte Ashfield (New-square, Newbury), D Co. 1/2nd Royal Berks, British Expeditionary Force, writes: Will you allow be to thank the Royal Berks Regiment Pipe, Tobacco and Cigarette Fund, whose gifts reach us with unfailing regularity and are much appreciated. Also for the “Newbury Weekly News,” which also reaches us, and every corner of the good old newspaper gets eagerly scanned, even by London boys, who always find something of interest to them. The readers of the “NWN” may like to know that we are re-organising a drum and fife band for marches, concerts and church parades when back at rest from the trenches. A letter has been received from Pte W Ashfield, of the 1st Royal Berks, giving a description of recent fighting. He says they were advancing, when they heard the order given to retire, and of course, obeyed. It was afterwards ascertained that this was one of the tricks of the enemy, but the Berks only fell back on the captured trench, which they held until relieved. Pte Ashfield left Newbury on August 8th, 1914, and has been in France for thirteen months, escaping so far with nothing worse than colds caught in the trenches. William fought throughout the war and lived until 1972. Alfred enlisted in the same regiment on 7 January 1915 and, after completing his initial training, he was sent to France to join the 5th Battalion of the Royal Berks on 28 July 1915. The battalion was itself new to France having crossed the channel the previous May. He took well to soldiering and was promoted to Corporal. With the battalion he went through the Battle of Loos in October 1915, during which they took heavy casualties, but Alfred survived. The ensuing months were what passed for quiet on the Western Front; no major assaults or raids, just the ongoing threat from shelling and snipers which saw a trickle of casualties. In February Alfred would received the bad news from home that his mother, Sarah, died on 17 February 1916 Newbury aged 48. War Diary, 5th Battalion, Royal Berkshire Regiment – 16 March 1916. Billets. The Battalion snipers won the Brigade competition for sniping with telescopic sight. Working parties found for trenches. Casualties O.R. 1 killed, 1 wounded. Another promising Newbury lad has been killed in action in France. His father, Mr W Ashfield, of New-square, Newbury, received this week the news of his son’s death, which took place on March 16. He was a Corporal in the Berkshires, and the officer of his platoon (Lieut Stanley Sharp) speaks of him as having been a most valued NCO, tremendously hard working and painstaking, and one in whom he placed entire confidence. The Lieut adds:- “He will be a great loss to me, and I felt his untimely end very much. I trust it will be some consolation to you when you think of the noble and brave way in which he met his death.” The deceased enlisted on the 7th January, 1915, and went abroad on the 28th of June [sic]. 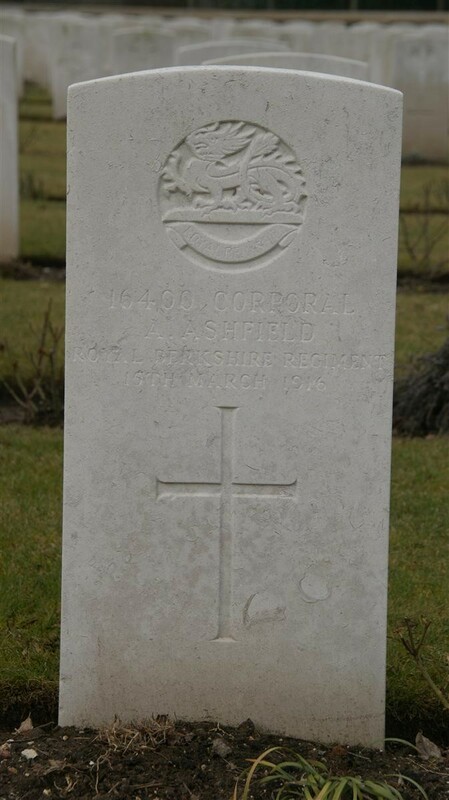 Alfred was buried in Vermelles British Cemetery, grave II.J.13. 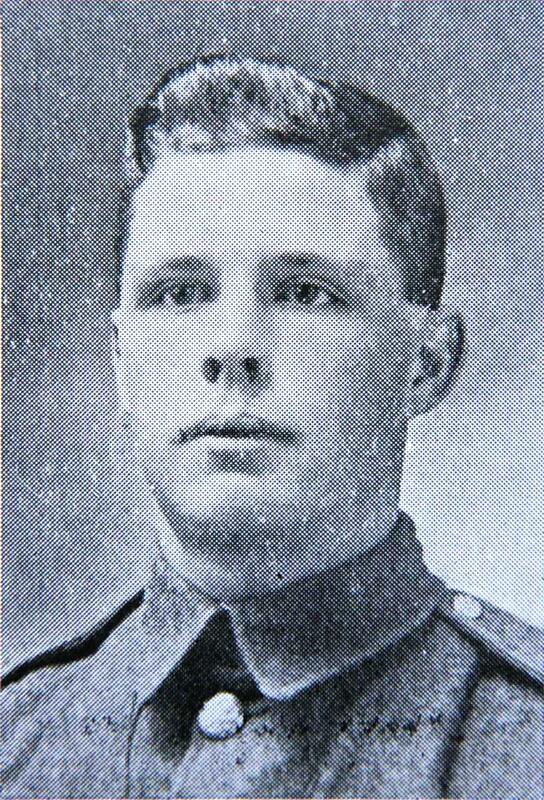 As well as Alfred and William another brother, Arthur, served in France. A fourth brother, Ernest, was of an age that would have resulted in his conscription, but he was not fit for military service; his condition was evidently a serious one, he died on 18 March 1917. The remaining brothers, Henry Albert and Frederick Bertram were too young to be involved in the Great War. However, Frederick served in the Royal Navy in WWII and died when his ship, the HMS Daring, was sunk by the U23 on 19 February 1940. 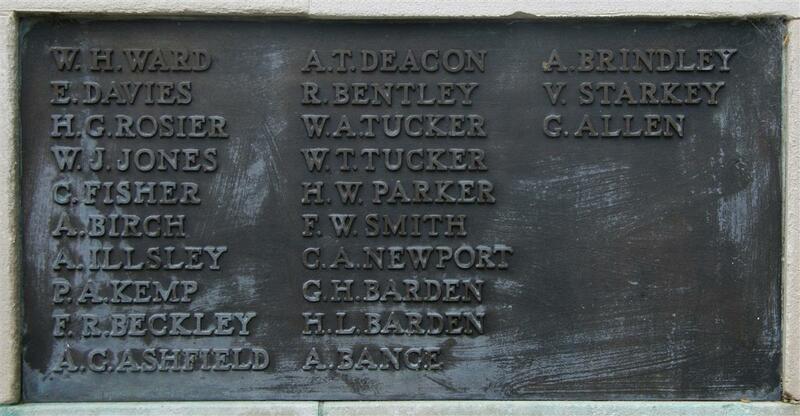 Albert was remembered on panel 6 of the Newbury Town War Memorial when it was constructed in 1922; Frederick’s name was added among the additions following WWII. Alfred is also remembered on the Cold Ash war memorial; his father moved after the war to ‘Pear Tree Cottage, Shaw Fields, Newbury’ – despite the address this was in Cold Ash and not Shaw or Newbury.